Does Matter falls on earth exactly like antimatter would do? This fundamental question is still not answered experimentally. However, to determine the gravitational forces, charged test particles are not well suited since any small gravitational effect is fully masked by orders-of-magnitude stronger Coulomb forces from electric stray fields. The gravitational force on a positron by the earth is more than 20 times weaker than an electrostatic force on it from one single electron charge at 1m distance. The challenge is to confine, cool and measure the free fall of neutral anti-matter atoms. 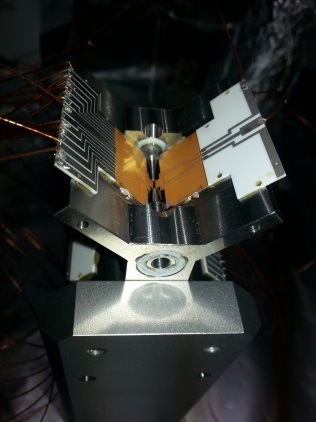 Within the GBAR collaboration (http://gbar.in2p3.fr/, http://gbar.web.cern.ch/GBAR/), two partners from the Johannes Gutenberg-University Mainz aim for experimenting with anti-H ions (2e+ + p-) generated from p- and e+ reactions, captured from the ELENA decelerator ring at CERN, and cooled in a Paul trap to the quantum ground state. Then the positron detached with a laser pulse and the non-confined neutral antimatter atom follows its gravitational force. By measuring falling time histograms the acceleration g-bar will be determined. Currently we are setting up the experiment with Ca and Be ions for first tests. The project is a cooperation of the groups of Prof. Ferdinand Schmidt-Kaler and Prof. Jochen Walz in Mainz and Laurent Hilico at Laboratoire Kastler Brossel in Paris. First teste with Calcium and Beryllium will be done in Mainz, afterwards the setup will be run with Beryllium and Hydrogen in Paris. An overview of the main experimental steps can be found in these papers (1, 2). Our funding is provided by the PRISMA Cluster of Excellence (http://www.prisma.uni-mainz.de/) and from DFG/ANR (http://www.dfg.de/).